Lifelong learning: Syed Mansor chatting with a fellow university student at the IIUM campus in Kuala Lumpur. After decades of toiling round the clock and raising a family, most retirees would prefer to sit back and relax. But 71-year-old Syed Mansor Syed Salim has decided to go back to school to follow his dream of becoming a lawyer. “Education does not end when you reach 40 or 50, it is a journey of lifelong learning. “It’s not going to be easy, but this is where my passion lies,” said Syed Mansor, who is in his first semester reading law at the International Islamic University Malaysia (IIUM). “With all the turmoil that is going on, law teaches us to see what is legally right and what is legally wrong, as well as to be fair, reasonable, and equitable; this is why I want to study it,” said the retired Kedah state land officer. A law degree will be another feather in his cap. He obtained a degree in public administration from Universiti Utara Malaysia (UUM) in the early 2000s. His dream is to be called to the Malaysian Bar and to set up practice with his daughter who is a lawyer. Determined to fulfil his dream, the grandfather of seven moved into a dormitory with three other students to focus on his studies. A typical day for him begins at 7am, where he would walk some 200m to the campus centre for classes and study sessions before returning at about 9pm. 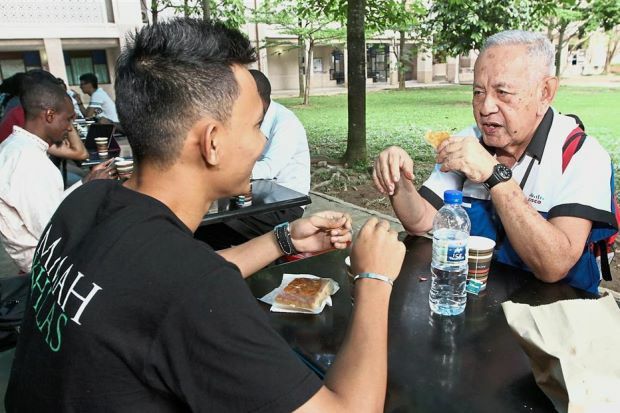 “I feel very much at home here, my classmates are as young as 19 and they call me Tok Wan. Meanwhile, lecturers call me Pak Syed. “My lecturers are very good,” he said, adding that he has learnt to use e-learning websites. His wife and their nine children have been very encouraging, he said. Born in 1945, Syed Mansor recalled growing up in a single pa­rent household during the Malayan Emergency, when opportunities for education were scarce. But he had always reached for the moon and been bold in trying new things. In 1990, Syed Mansor even dipped his toe in politics and contested for the Sungai Petani seat under Tengku Razaleigh Hamzah’s now defunct political party Semangat 46. “I did not win, but I’ve always kept my finger on the pulse of (Malaysian) current affairs,” he said. Syed Mansor said that his most memorable moment in his career was when he was able to study in UUM, years after he helped to set it up. “However, my biggest achievement has yet to come. “The proudest moment of my life will be when I graduate and become a practising lawyer,” Syed Mansor added. Inspiring. Each sentence of this story tells an amazing story.